What is Elemental Sword? What's the difference when compared to Crimson weapons? According to iRO Database (http://db.irowiki.or...tem-info/13414/), it says its element is neutral. Then it also says "A magical sword that bears 4 different properties of nature. Very effective to enemies without the properties of Water, Wind, Earth and Fire". So does it have elements imbued with it or not? If yes, what are the elements that it has? Also if possible, could you explain this too? Adds a 5% chance of using [Cold Bolt] Lv 3 on the target when doing a physical attack. Casts [Fire Bolt] Lv 3 on the target when [Cold Bolt] is used. Casts [Lightning Bolt] Lv 3 on the target when [Fire Bolt] is used. Casts [Earth Spike] Lv 3 on the target when [Lightning Bolt] is used. And the effect is very simple. On any physical normal attack, there's a 5% chance to proc cold bolt. earth spike if lightning activates. 5% chance to proc all these since it will cause a chain reaction. its neutral element as mentioned on its description. All it does is auto-cast 4 types of spell bolts (magic spells) when you attack at a 5% chance, its the spell bolts that have different elements. Can the effect on the sword stack with the effects of CD in Mouth or Lunar Rainbow? 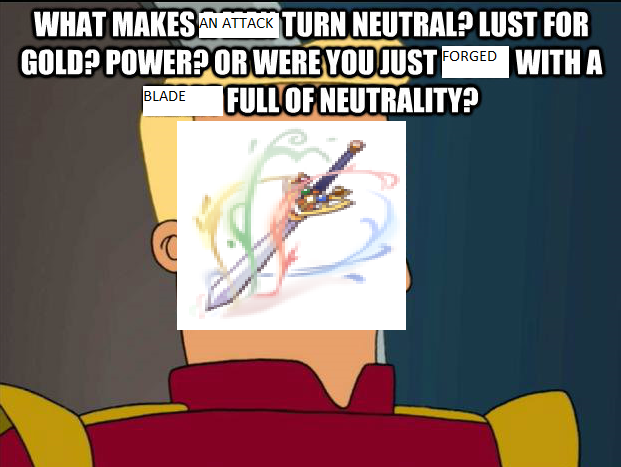 So the Elemental Sword's physical attack is neutral?